The s/v Ruach arrived safely in Alotau, Papua New Guinea at 10 am, Saturday 21st October 2017 after a successful maiden voyage. 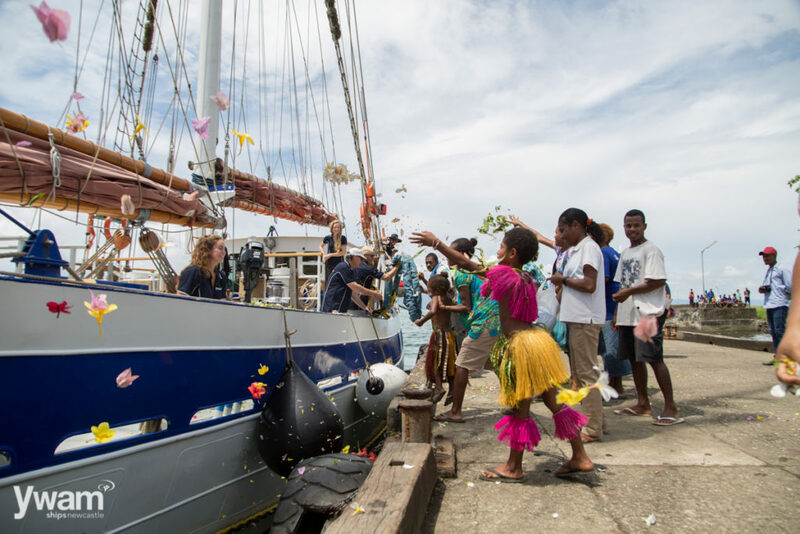 After sailing 14,000 nautical miles from Germany to Australia last year, the s/v Ruach’s arrival in Alotau is a huge milestone marker in YWAM Ships Newcastle’s journey to deliver vital healthcare and training services to the remote islands of PNG. The crew of the medical vessel were welcomed by Lindsay Aleasana, Milne Bay District Administrator, Town Mayor Gita Elliot and numerous other senior administrators and CEO’s of health and education departments. Alotau residents and cultural dancers from Mutuuwa Village were also present to welcome the s/v Ruach in an official ceremony at The Government Wharf. Mr Aleasana welcomed the s/v Ruach and the YWAM Ships Newcastle crew to Alotau on behalf of the Deputy Prime Minister, Charles Able and looks forward to collaborating with YWAM Ships to see greater development of the province. “The government is talking about delivery of these [health and training] services, and we cannot do it on our own. Alotau and the Milne Bay Province stands ready and proud to partner with YWAM.” said Mr Alesana. YWAM Ships Managing Director, Mr David Stephenson, is thrilled that the s/v Ruach has arrived in PNG and said the operations of the vessel will be a collaborative effort between national and provincial health and maritime authorities, and a range of volunteers from around the world. “We are meeting with leaders in both the health and maritime sectors to discuss how we can best serve the nation of Papua New Guinea. Recent discussions with provincial authorities have been productive and together we are exploring locations and health and training activities for the s/v Ruach and our volunteers. “We look forward to welcoming many of these leaders aboard over the coming weeks to map out the vessel’s first deployment.” said Mr Stephenson. YWAM Ships Newcastle will be hosting marine sail training seminars in Alotua for the next two – three weeks. Seminar participants will have the opportunity to come aboard the s/v Ruach for practical training and experience. YWAM Ships Newcastle is offering the opportunity for marine, medical and general volunteers to join the s/v Ruach in Papua New Guinea as we begin outreaches over the summer. Applications can be found here.